Homes For Sale in Corvallis OR (97330, 97333). 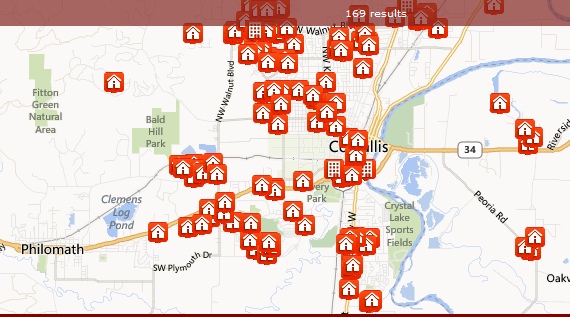 Full details and all photos of all available Homes For Sale in Corvallis, Oregon. Our for sale property information is a direct feed from the Willamette Valley MLS and is updated several times daily. Is it time to sell? Request a FREE custom evaluation for your Property. This entry was posted in Albany OR real estate, Corvallis OR real estate, homes for sale, Homes for Sale in Corvallis OR, Oregon State University, Terri Woods real estate and tagged Albany, Corvallis Homes for Sale, GreatOregonHomes.com, Philomath, Terri Woods real estate. Bookmark the permalink.